Paint will save you the most money on a kitchen renovation. In total, I have 27 cabinet doors (in different shapes & sizes), 9 drawers and 1 cutting board. Its time. I'm done talking about it (for 10+ years). And I'm excited to have some DIY fun! Plus I want to share it all and show you what I'm doing (incase you are thinking about doing something similar). Yes, CABINET PAINTING will be involved! ​And now... the scary (and slightly embarrassing) part: The Before Pictures. Can you say 1980's? Yup. Proof that I do not have an awesomely decorated home. Yep. Remember the story of the Cobbler's children who had no shoes? Well, I haven't gotten around to my own home because I've been busy working on painting furniture for other people and teaching students how to paint THEIR kitchens! I shopped around to learn what types of counters were available. I went to Lowe's. I picked out my counter. I didn't want laminate (formica is the "low end" counter material), and was told the durability of the corian-type-composite counters was 'eh. Granite? Probably not in my budget... until - wait - it's on sale?!?! And its cheaper than the plastic ones?!?! DONE. My friend was installing vinyl planks that look like hardwood in her basement apartment. "It literally snaps together and you can cut it with a box cutter" I believe were her words. So I did some research, priced it out, and discovered Lifeproof Vinyl Flooring in Sterling Oak. It's quite affordable (under $3 per sq ft at Home Depot). Plus it has built in padding, which is great on concrete floors (aka. my kitchen)! I carried my floor swatches around for a week, trying to coordinate them with everything. Oh, tiles! So many choices! So many colors! So many patterns! So much bling! This is where I reminded myself "you're on a budget, you're on a budget, remember!" I already knew I needed white cabinets. I knew I would use General Finishes products for the cabinets, so I chose a slight-off-white for the cabinets (see Part 2 for more details). And then I went to Sherwin Williams and picked out a bunch of light gray paint swatches for the walls. After narrowing down my choices to 3 shades of gray, I put my swatches up on the wall next to my counter, floor & tile samples, pondered them in different lighting for a few days, and finally decided on SW 7071 Gray Screen for the walls. If you haven't ordered from D. Lawless Hardware before, you will thank me. Let's just say they are VERY reasonably priced for the high quality of their products. (Disclaimer: I've spent many hours on their website.) I've been using their hardware on furniture for a while and LOVE it! You're welcome! 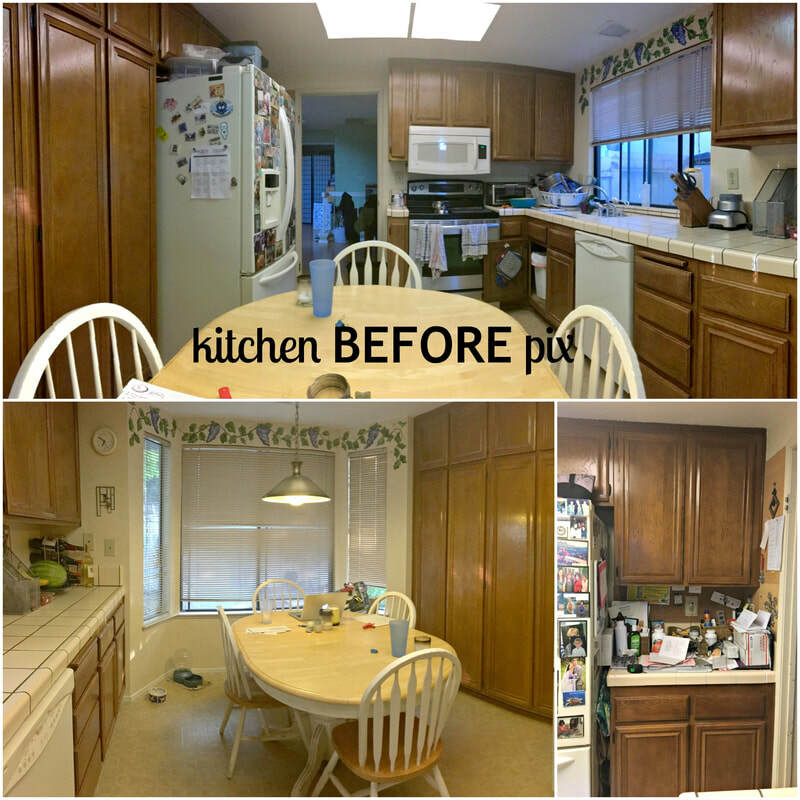 I wasn't originally planning on replacing the hinges on my cabinets. They seemed to be dark bronze-ish. And I didn't want to paint them (painted hinges don't wear well over time). And I personally like it when the cabinet handles & knobs coordinate with the hinges (if they are showing). So I chose Venetian Bronze handles and matching knobs with a little bit of copper showing through. Eventually, I realized the original hinges didn't match, so I replaced them with new, inexpensive Venetian Bronze hinges (also from D. Lawless Hardware - thanks, guys!). 1. Get samples of everything, and look at them in different lighting in the room you are making over. Lighting is EVERYTHING! Make sure you like them during the day AND at night. Make sure they still "match" in different lighting. And keep in mind what colors and textures will be touching each other. You don't want to get dizzy when you look at them. 2. Also if you are trying to save money, shop around for materials. Learn which materials are "high end" and "low end" and find materials that fit your budget. You'd be surprised what you can find on sale! Most of all KEEP IT SIMPLE! And have FUN! We've been having an El Nino winter here in Northern California. Although we really need the rain, those rainy-day blues have been keeping us inside. In honor of the rain, I felt the need to paint something blue! 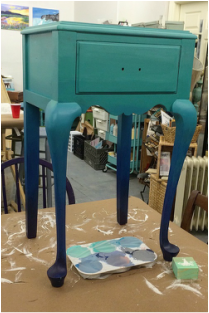 With General Finishes Milk Paint there are so many gorgeous blues to choose from! I decided to do a little ombre using 4 colors: Coastal Blue, Klein Blue, Patina Green and Snow White. Next I visually mapped out my piece into 6 sections, knowing that each of the colors (above) was going to be centered in each of the sections. Then starting from the bottom, I painted the darkest color, then blended it into the next darkest, and all the way up to the lightest color on top. 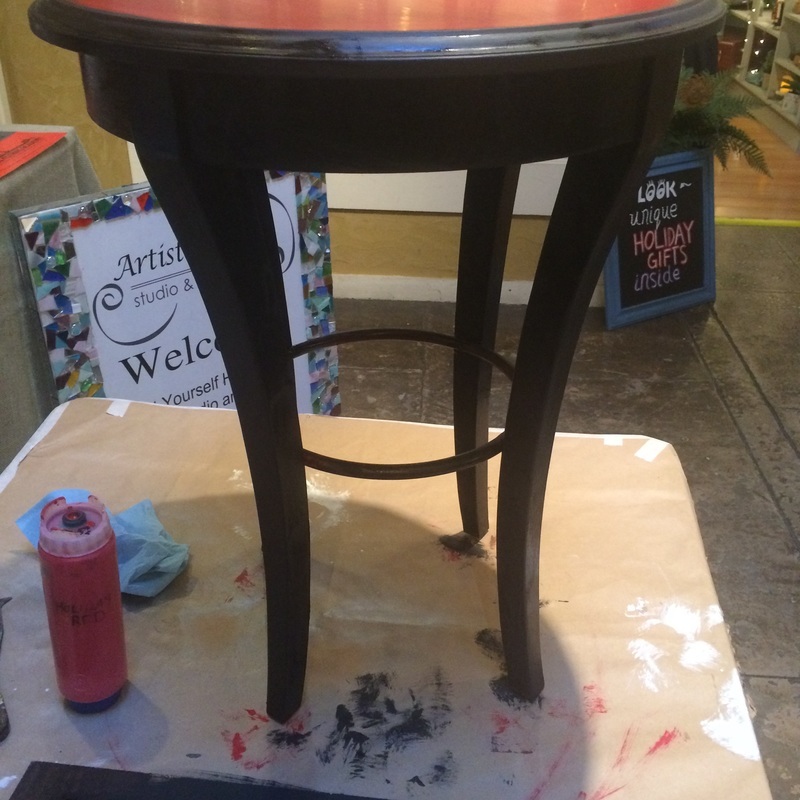 At this point (with just one coat) someone came in and bought the table even though it wasn't finished! For the second (touch-up) coat, I added a few drops of Extender to the paint to keep it from drying too quickly while blending. Using a small bit of paint, I worked on blending out any transitions between colors, to make them less obvious. Once dry, I cleaned up the hardware and handed it off to its happy new owner! Clean your piece before you paint it! We've been telling our customers this forever! No matter what type of paint you are going to use, whether its a "minimal prep" paint or not, you must clean your piece before you paint! 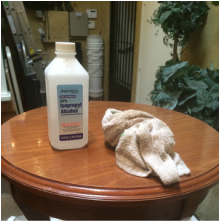 Over the years we've tried and recommended lots of different degreaser cleaners for prepping furniture. Everything from TSP and mineral spirits, to Simple Green and Krud Kutter. We've made all sorts of recommendations and tried different products for different jobs. Some work better than others for certain conditions. Denatured Alcohol (available at any hardware or paint store). Scotch Brite sponge (the green, scratchy kind). Paper towels (or a lint-free rag). A fine grit sanding pad or 220-400 grit sandpaper. Mix the denatured alcohol 50/50 with water. I like to keep a bunch pre-mixed in a plastic bottle (drip or spray works just fine). Pour some 50/50 Denatured Alcohol/Water mix on the scotch brite sponge. 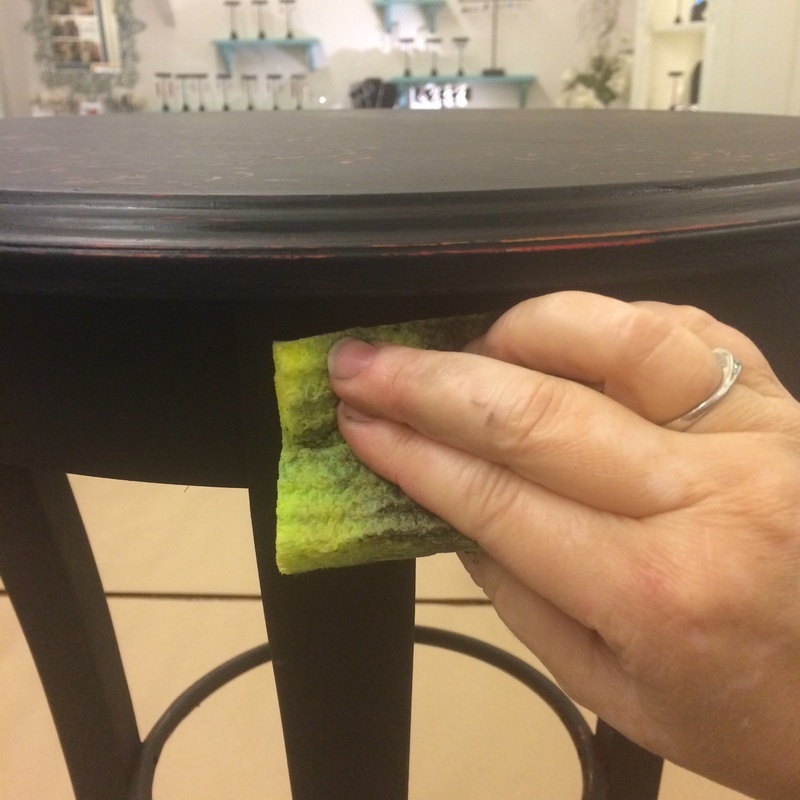 Scrub your furniture piece with this (all surfaces that you will paint). This breaks down all the old wax, oils, furniture polish and dirt that may be hiding on your piece. 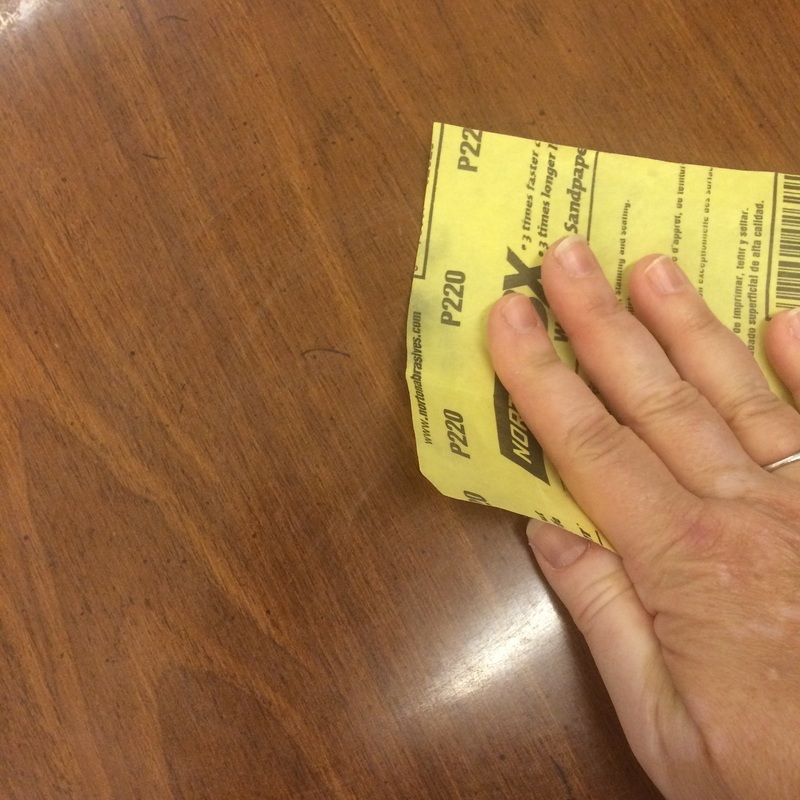 Wipe your piece dry with paper towels (or a lint-free rag). This will also help wipe off the residual dirt/wax/oil that the denatured alcohol just broke down. Scuff sand with the 220+ grit sandpaper. This does not mean removing all the old finish! It just means wiping the piece down with the sandpaper to scuff up any sheen that might be on it. This is especially important if you have a high gloss surface! Scuff sanding will give the paint something to bite into and hold onto once it dries. Wipe off the piece with a damp rag to remove any dust that might have formed during scuff sanding. Our friends at General Finishes have a video on this prep method, incase you're visually inclined. We are very excited to try General Finishes new Chalk Style Paint! The folks at GF were kind enough to send me some samples to try out! A pint of Bone White and Black Pepper arrived the other day and I could not wait to play with them. Last year at this time I was painting a Mackenzie-Childs style dining room table (think black & white checkers) and I really didn't want to relive the checkered theme. 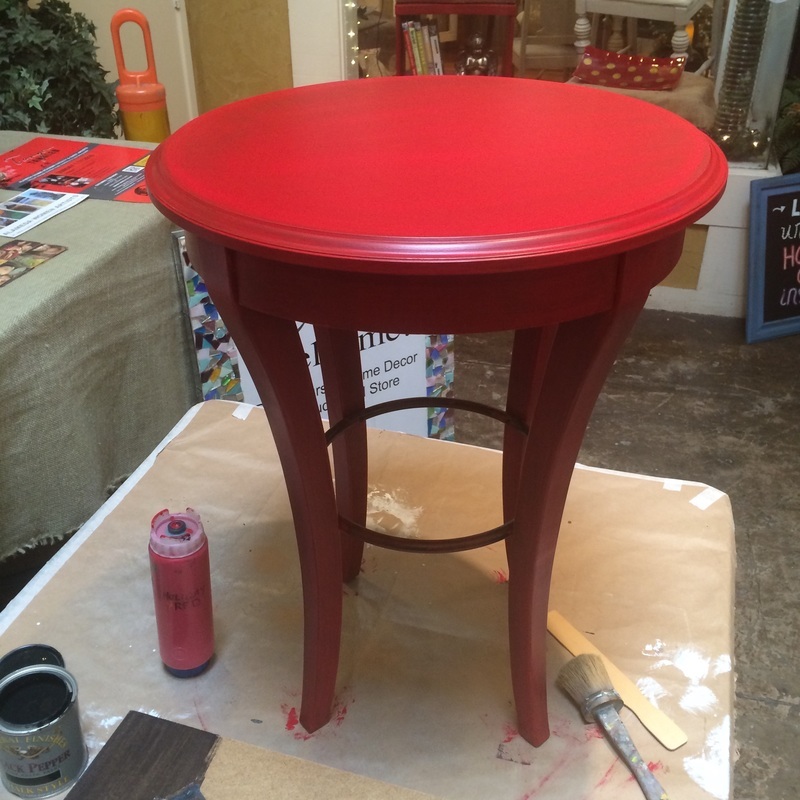 So I decided to try a combo of the Black Pepper Chalk Style Paint and Holiday Red Milk Paint. After all, its the holiday season! I found it at a local consignment store before they sadly went out of business. It looks like something you would find in a hotel room. Minimal prep is needed with GF paints! Its one of the things I love most about them. I just scuffed the shiny top with a little 220 grit sand paper. Then I wiped the whole piece off with a mix of rubbing alcohol & water. I recommend using a 50/50 denatured alcohol/water mix. But the rubbing alcohol was what I had on hand. Next I wiped the whole thing down with a damp rag and let it dry. Done. 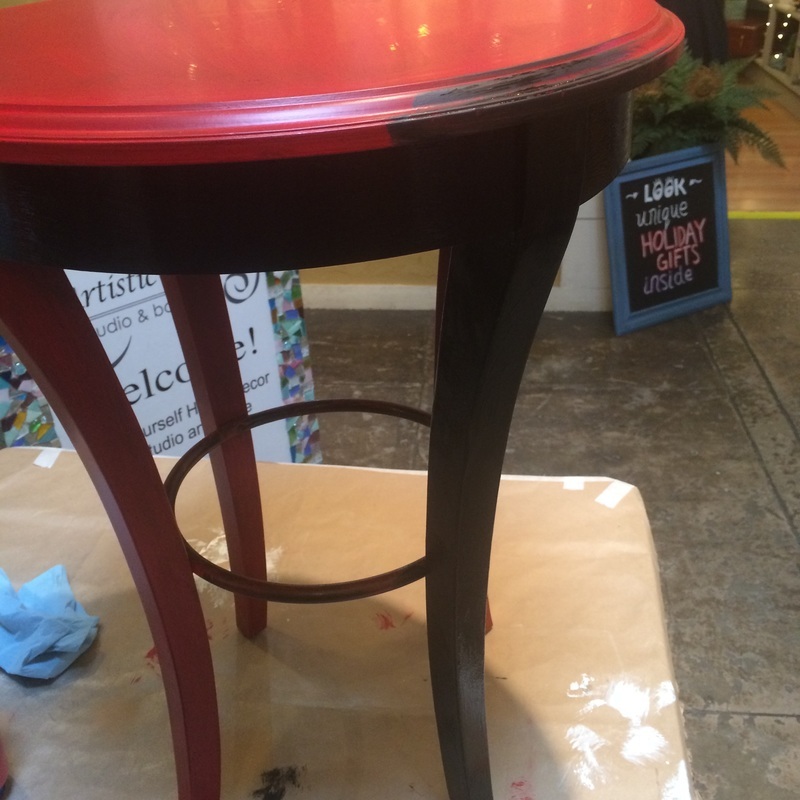 I then painted the whole table with Holiday Red Milk Paint. As I was working, people passing by kept saying they loved the way it looked! I gently told them that it would not stay this way. One red coat covered very nicely! It has awesome coverage! One coat fully covered up all the red. 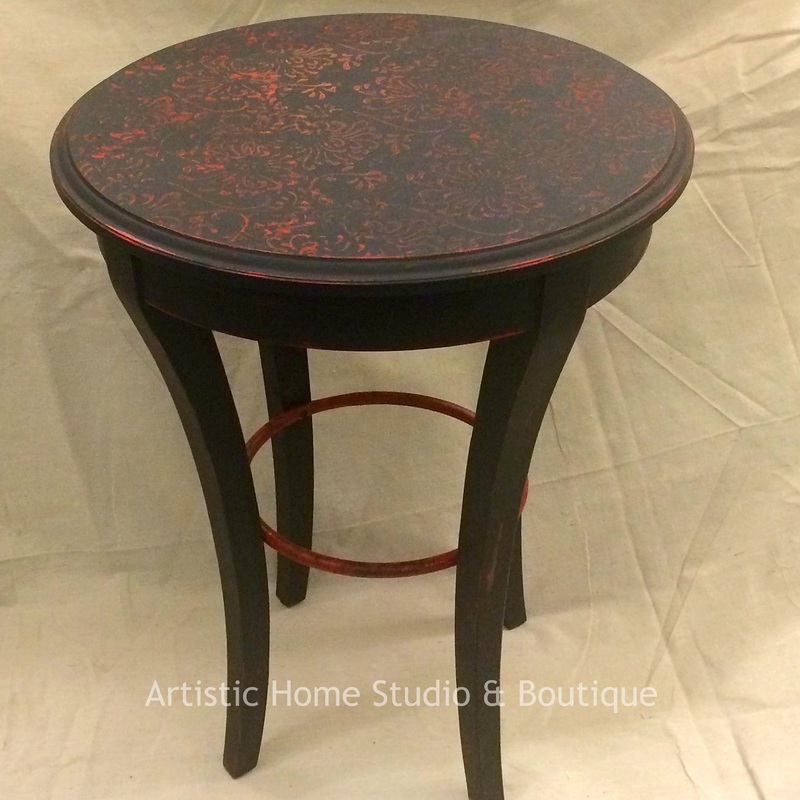 It covers with a bit more texture than GF Milk Paint. Definitely more of a vintage/hand-crafted look. It dries quickly! Faster than GF Milk Paint. It has a velvety, matte finish when it dries. Exactly like Annie Sloan Chalk Paint or Pure & Original Classico. One passer-by commented: "it has no smell!" Because the Chalk Style Paint dries quickly, I decided to add a few drops of extender to it for the next step. The extender keeps it "wet" longer and I wanted time to run the roller through it. 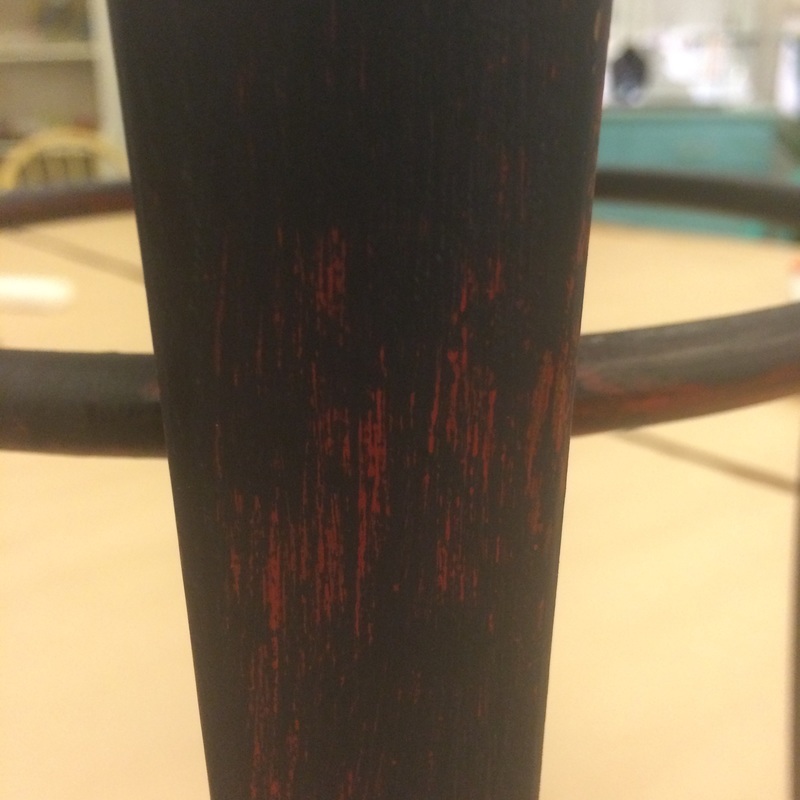 I put a nice, heavy wet coat of Black Pepper on the table top, then ran the roller through it, carving through the paint to reveal some of the red. Once dried, it looked pretty cool! 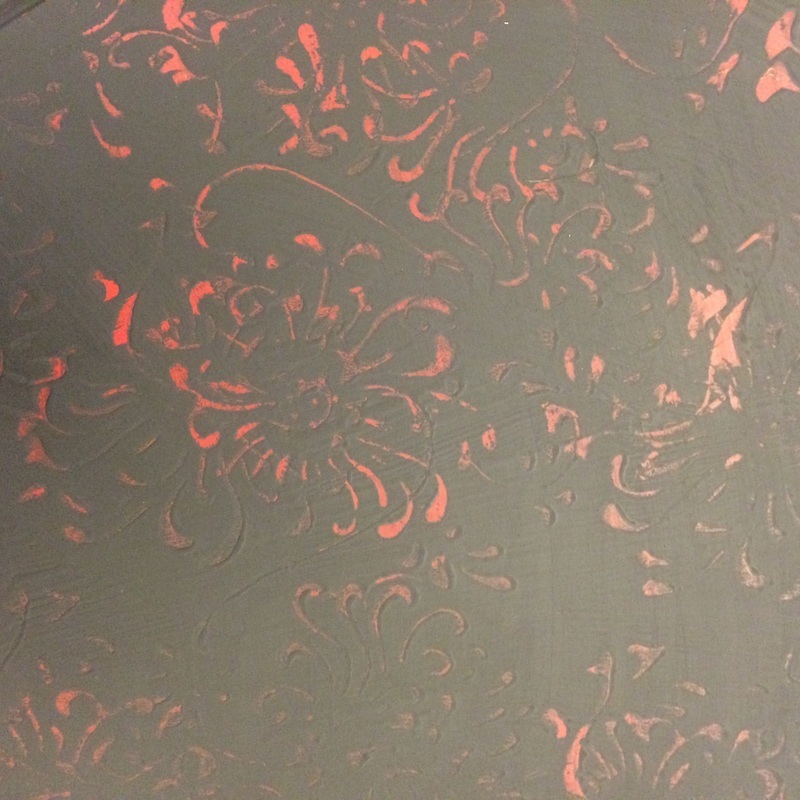 The Chalk Style Paint really has a beautiful, matte finish! 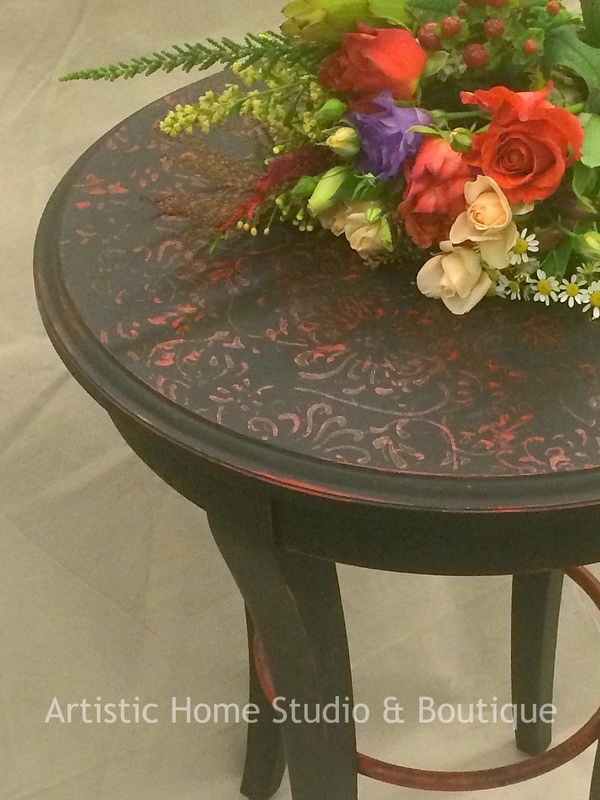 Next, I decided to "wet distress" the Black Pepper Chalk Style Paint to give the table more of a vintage feel. 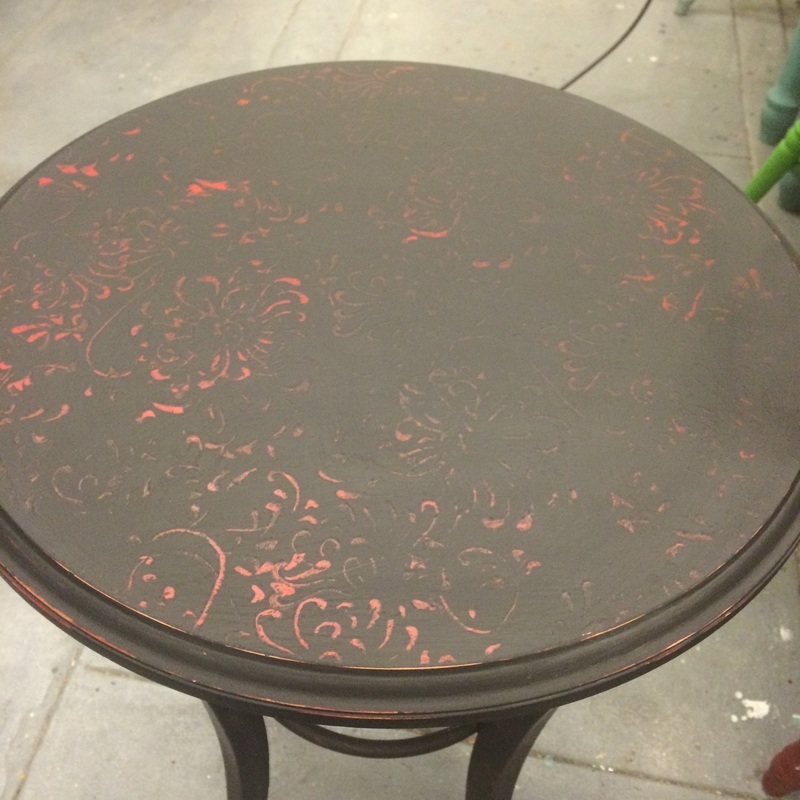 This is a technique that is easy to do with Annie Sloan Chalk Paint and I wanted to see how it compared. I used a damp Scotch-brite sponge - the green side to distress, the yellow side to wipe off the residue. Interestingly, more elbow grease was needed to "wet distress" the Chalk Style Paint than is usually needed to "wet distress" Annie Sloan Chalk Paint. But it still distresses nicely. Also the color doesn't change with burnishing, which is a nice bonus. 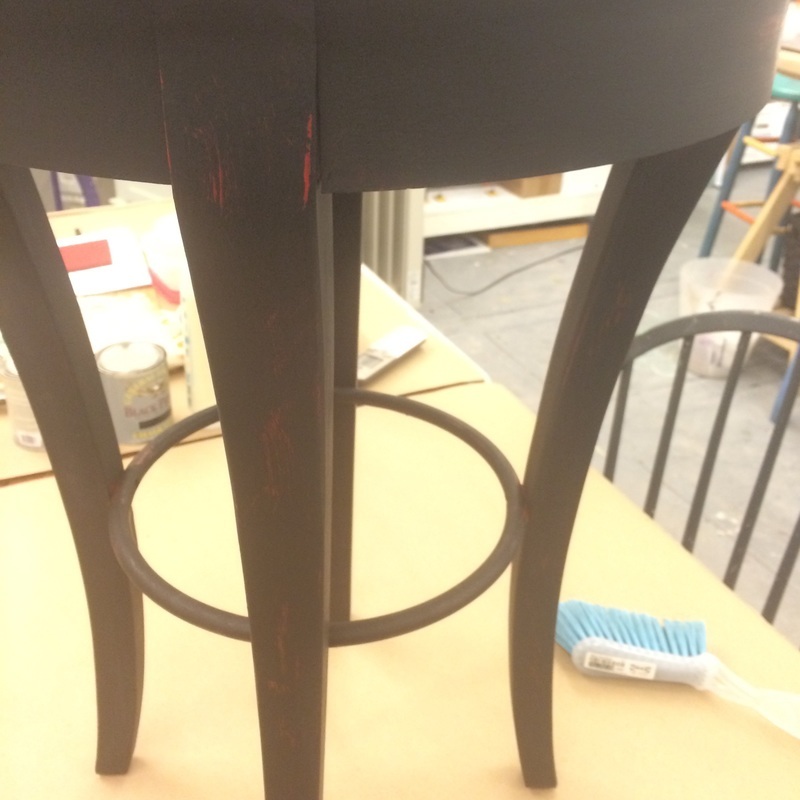 The Holiday Red Milk Paint underneath remained intact. 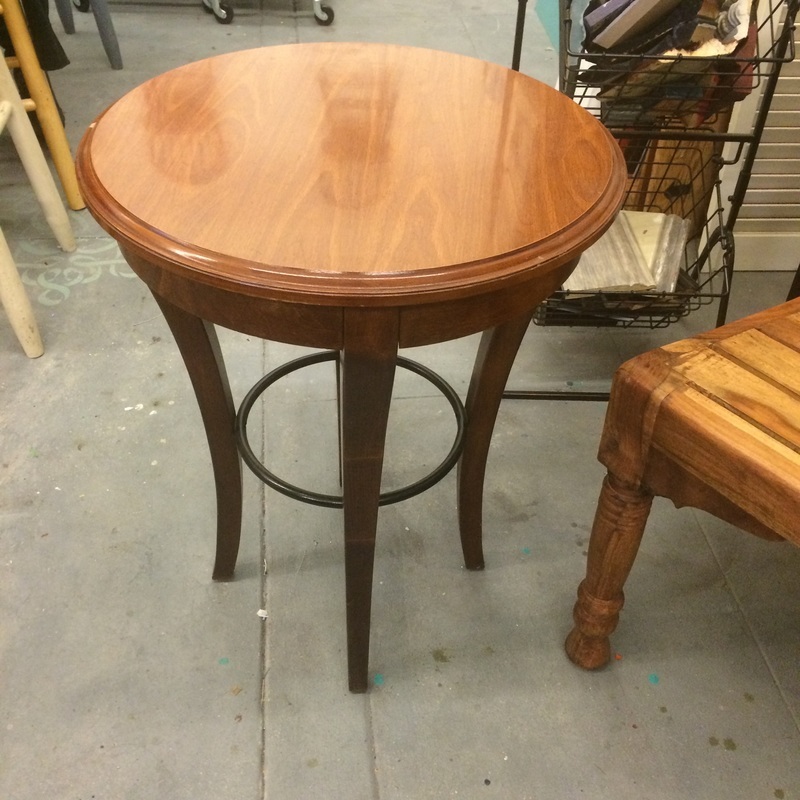 Stepping back and looking at the table, I decided I wanted the roller pattern to stand out more on the top. 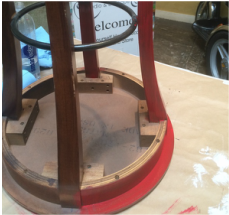 So I ran the roller through a bit of Holiday Red, and went back over the top of the table, applying paint this time instead of removing it. Yes, it was just what was needed. That and some flowers from our nice neighbors at Dandelion Flower Shop (thanks, Karim!). Coming Soon: A New Chalk Style Paint! 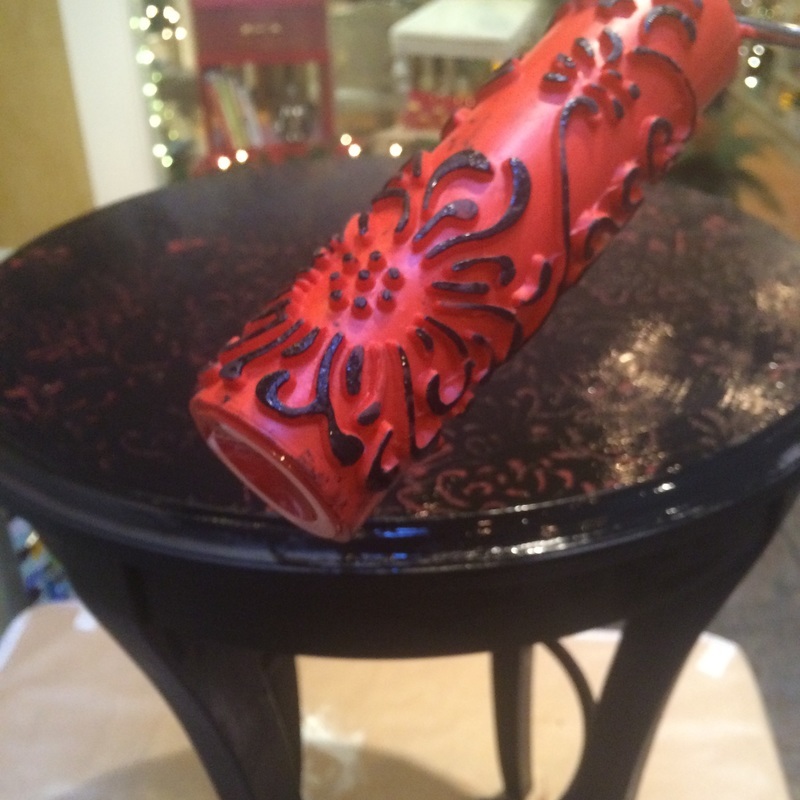 For those of you who love to paint furniture and love using Chalk Paint, we've got you covered! General Finishes Chalk Style Paint is a WINNER! 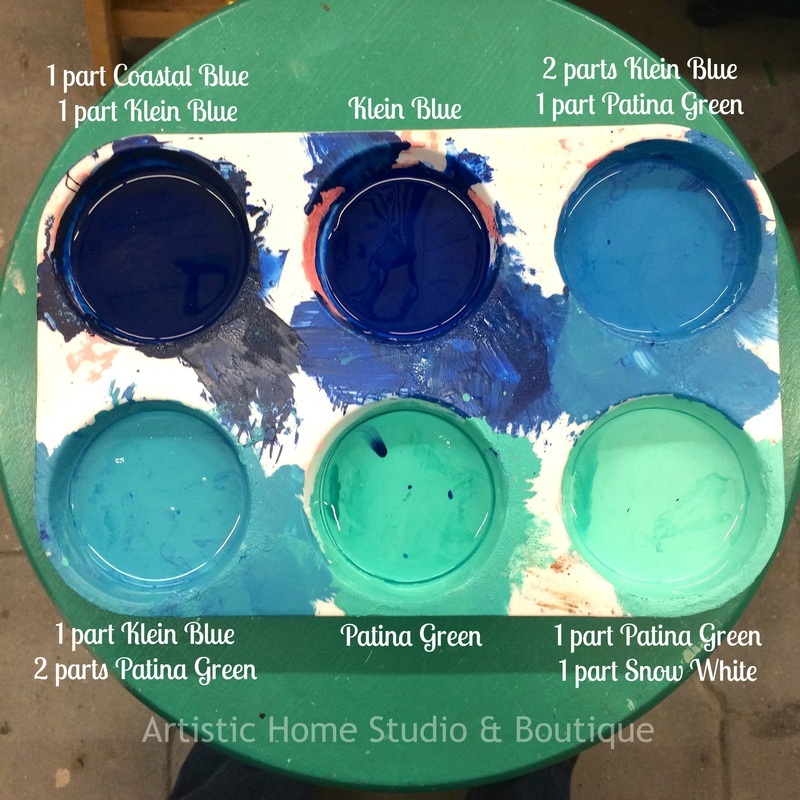 We've been testing it and comparing it with a few other Chalk Paints, and we absolutely love it! Our first impression is that it dries with a beautiful velvety, chalky finish. It is easier to wet-distress than Milk Paint, has excellent coverage, and is still a minimal-prep, easy to use paint for furniture and more. 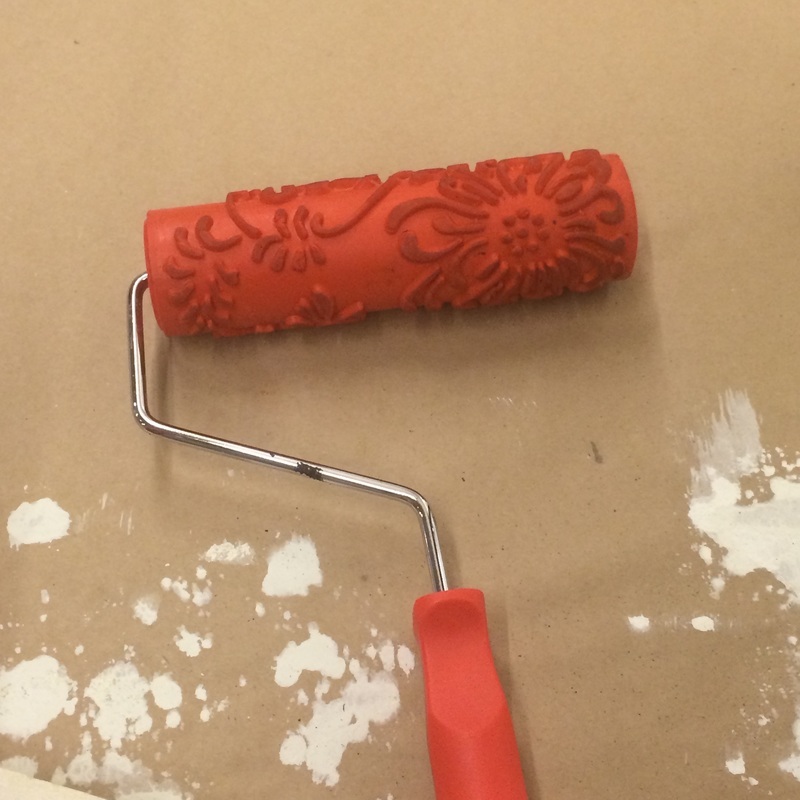 It is more durable than the other chalk paints we tested as well. What is the difference between Chalk Style Paint and Milk Paint? Stay tuned for some fun projects we are working on with these two paints! 1. Ladies it's time to nurture yourselves! 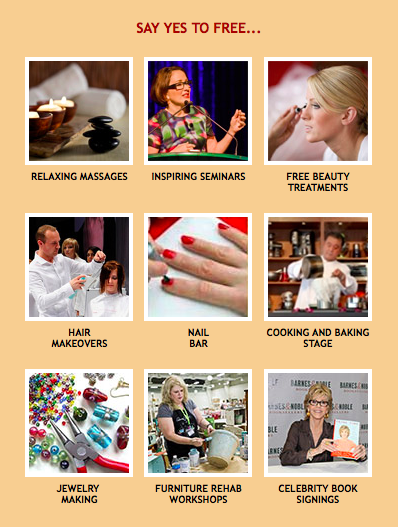 Spend a day getting FREE spa treatments, going shopping, learning from celebrity speakers, and doing something creative - for YOU! 3. 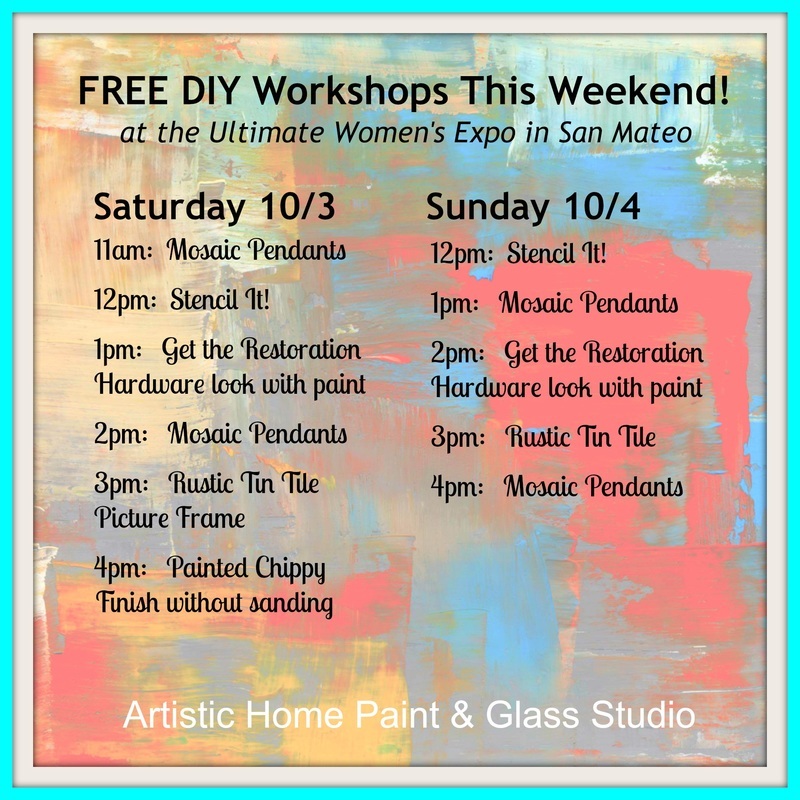 We are offering FREE DIY workshops! Learn several furniture painting techniques - for FREE! 4. Make a beautiful mosaic pendant - for FREE! 5. 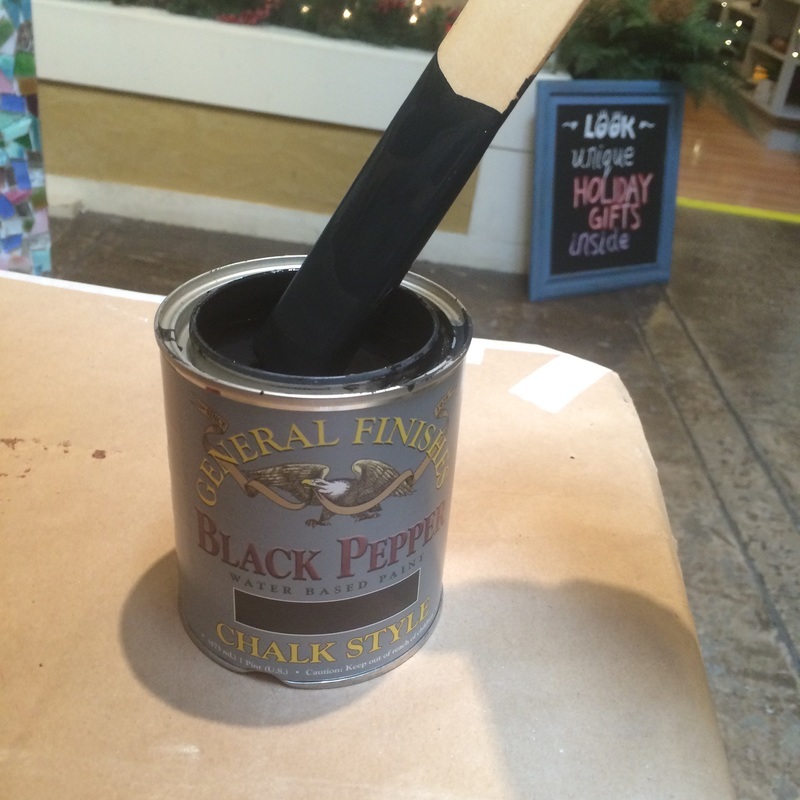 We will be giving out FREE SAMPLES of General Finishes Milk Paint! Yes, you read that correctly! Stop by our booth and try out the best furniture and cabinet paint on the market today! Simple to use - no stripping, no priming and no waxing needed - no kidding! You will love it! 6. Enter our raffle to win 2 FREE TICKETS to one of our Pinterest UNPLUGGED art parties! And we are throwing in a bottle of wine to go with it! 7. 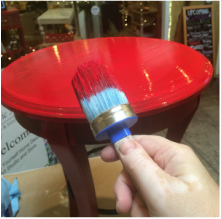 Enter our raffle to win The Ultimate Painting Gift: A whole basket full of paint, stain, glaze & topcoat products from General Finishes PLUS a gift certificate for one of our furniture painting workshops! 8. Stop by our booth and pick up your coupons for 10% off our upcoming painting classes! 9. 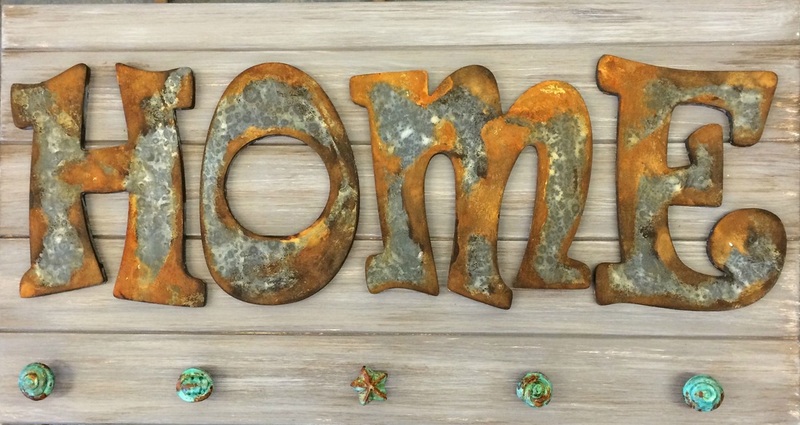 We have all sorts of beautiful hand-made jewelry, mosaics, fused glass, painted furniture & decor for sale in our booth to help you with your holiday shopping! 10. Why not have some fun this weekend?! We hope to see you there! It seems like everyone I talk to these days is updating their kitchens! 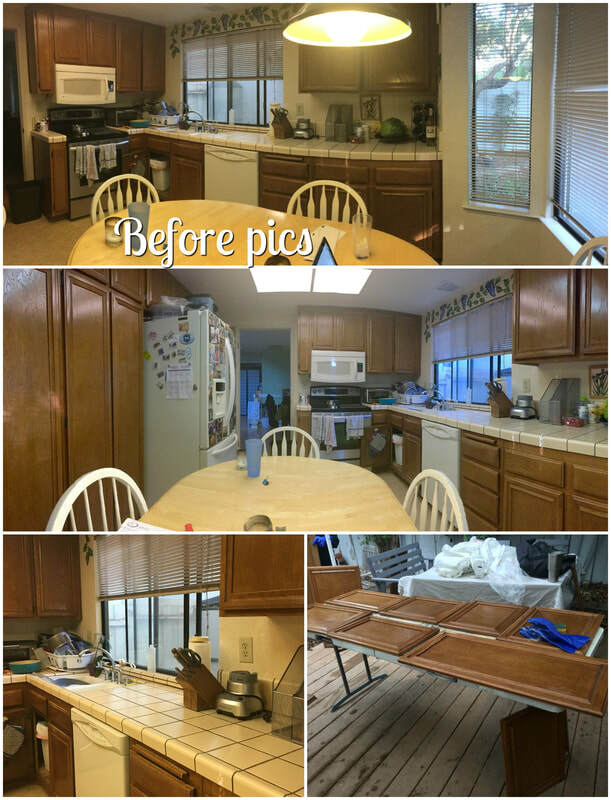 For those of us on a budget, painting or staining cabinets is a very affordable alternative to replacing or refacing them. If you're interested in learning how to do this, come visit us! We have all the supplies and free advice to help you out! In the meantime, General Finishes has some great video tutorials! 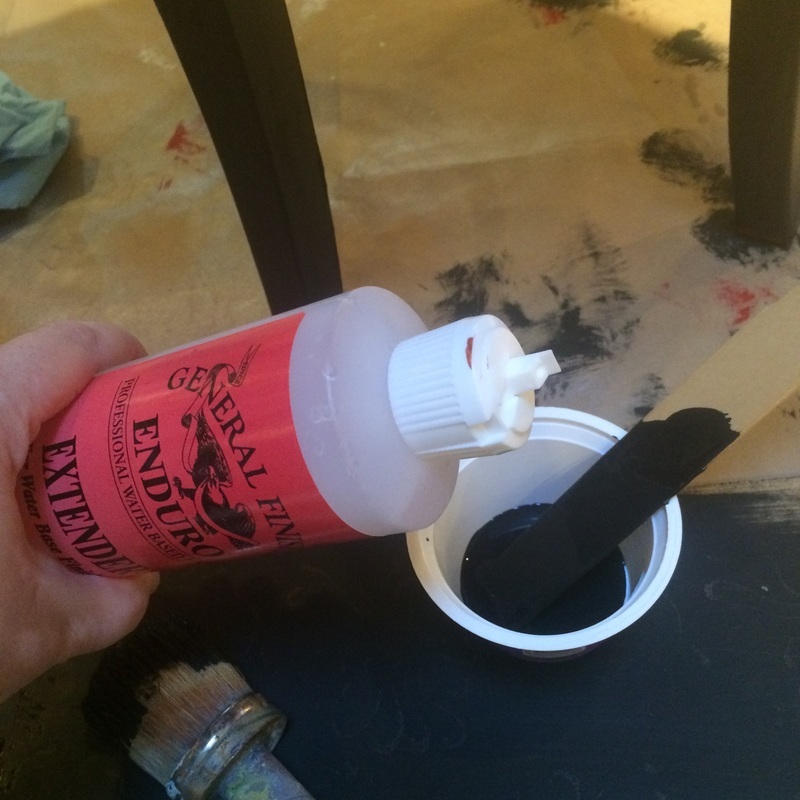 Here's a new one on how to apply their Gel Stains on kitchen cabinets. Enjoy! 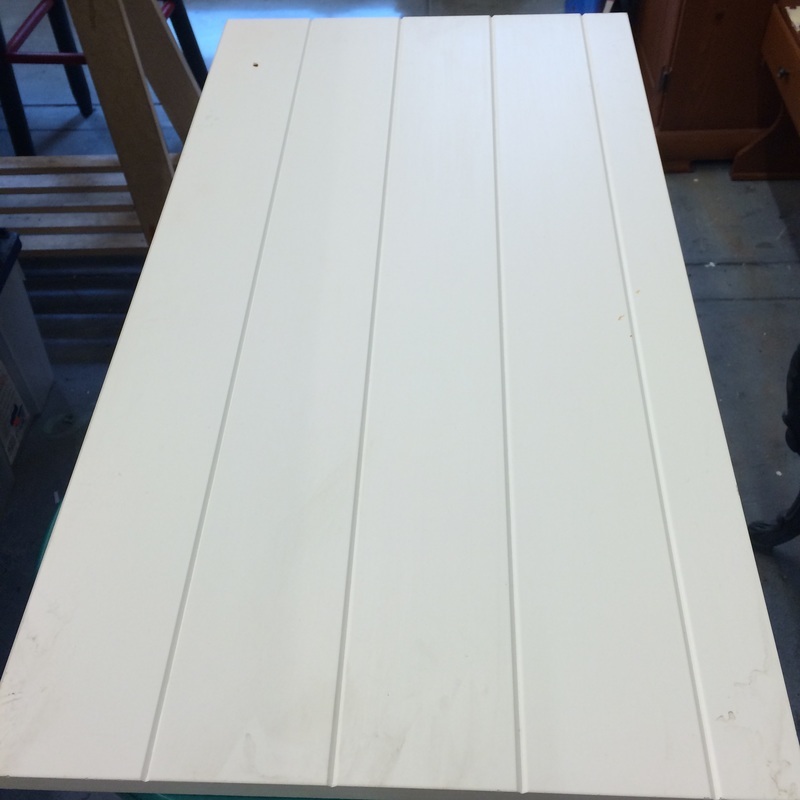 One of our favorite things to do is to keep old cabinet doors out of landfill! Just think about everyone you know who has done a kitchen or bathroom remodel. What did they do with their old cabinets? Did their contractor take them away and haul them off to the dump? Where do old cabinets go when they die? I've got a better idea. Here's a white cabinet door, and some white wooden letters from a craft store. In about 10 minutes, I dry-brushed the cabinet door with some General Finishes Milk Paint and Van Dyke Brown glaze, until it looked like driftwood. 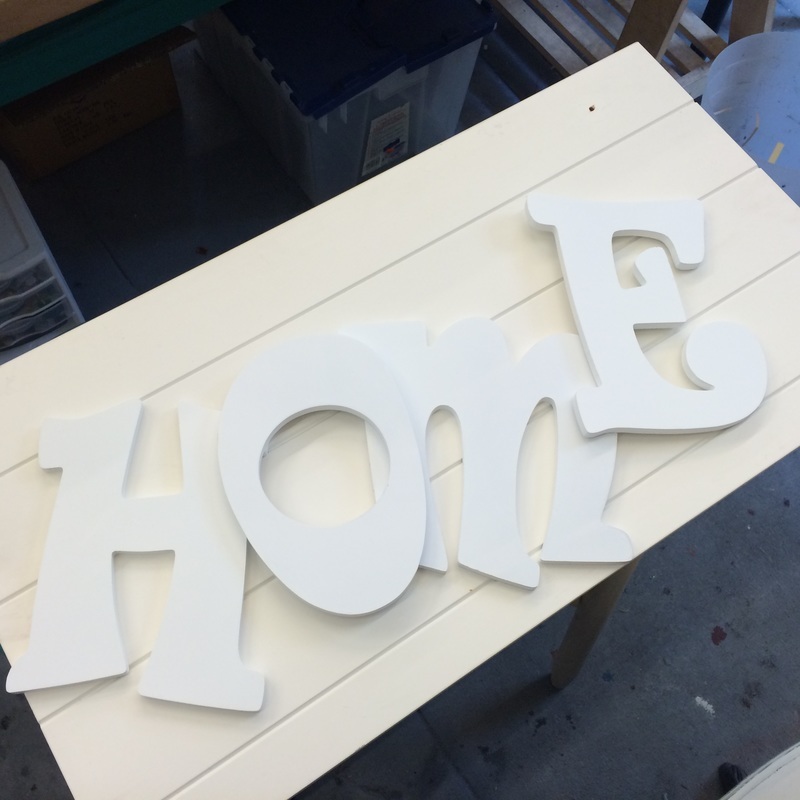 Then I took the wooden letters and painted them in GF Queenstown Grey (milk paint). It sticks really well to the white coating on the letters. Once they dried, I watered down some GF Seagull Grey (milk Paint) and washed over the dark grey and wiped back. Then to get the spotted look of tin, I splashed a few drops of rubbing alcohol on the letters to get the light grey wash to separate. Once all the paint dried (in about 30 minutes), I scraped some Modern Masters Metal Effects iron paint on the letters. Once it dried, I painted some rust patina on it (also Modern Masters Metal Effects). The next day, it looked rusty! In the meantime, I found some random knobs (all shiny silver) that needed some character. 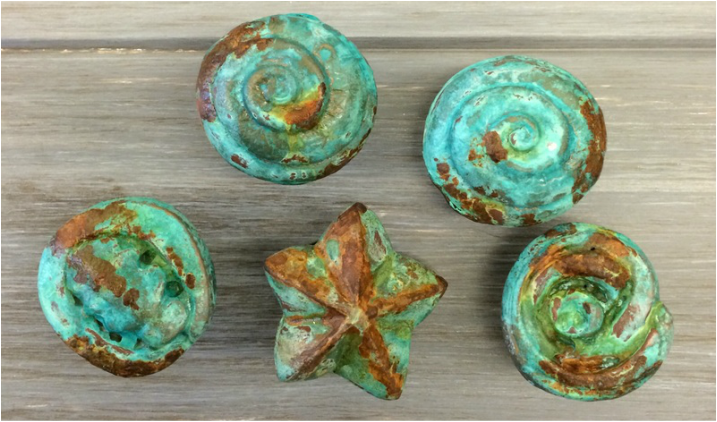 So with Metal Effects copper and iron paints, some blue patina and rust patina, I transformed them as well. 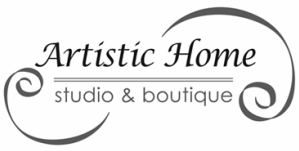 This is Rachel's blog about our adventures in bringing The Artistic Home Studio & Boutique to life.